Pel Nean (26 years old, pictured with her baby) is a Village Health Support Group volunteer in the remote Koh Nhek district of Mondulkiri province, northeast Cambodia. MONDULKIRI, Cambodia, 24 February 2015 – In counselling women during and after pregnancy, village health support group volunteer Pel Nean plays a vital role in bridging the knowledge, resource, and transport gaps in the community, and in connecting the community with the health system. 14-year-old Chan Sambath (second row, left) and her classmates during class in Tuol Skor School in Thnal Dach village, Kampong Speu province. The textbooks used are part of the Accelerated Learning Programme and provided by UNICEF. 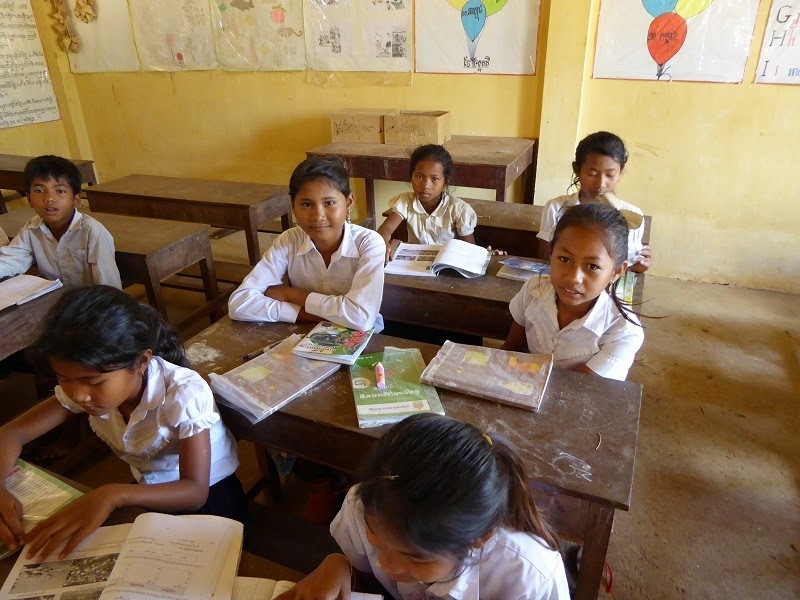 KAMPONG SPEU, Cambodia, 17 April 2015 – On a secluded dirt road, surrounded by mountains and rice fields, lies Tuol Skor School in Thnal Dach Village, Preah Khe Commune. It is the dry season and wherever you go, so does the dust. You can almost taste it in the air. The schoolyard is empty, all the students are in class. If it were not for the sound of children loudly repeating after their teachers, as though they were competing to see who can speak the loudest, one would think there is not much happening here. PREY VENG, Cambodia, 9 April 2015 – Build an app to collect information on wells in a user-friendly way; train 80 district officials to use it; send the officials to five provinces across Cambodia to map key wells with a smartphone or tablet; and you have a cutting-edge web-based well assessment system to help save lives next time a flood hits. 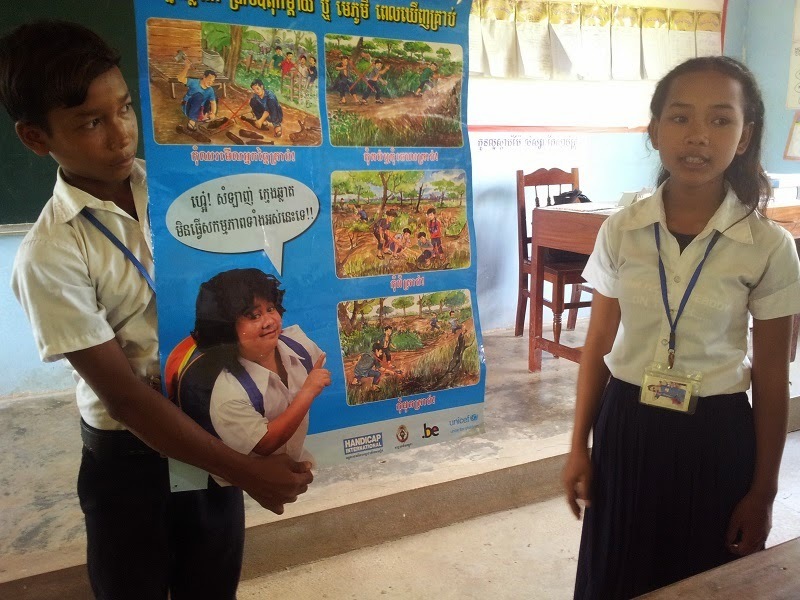 Vanna Sreymom, 17, (right) and her peer give a mine risk education lesson to students at Grand 4 in Chisang Primary School, Battambang province. PHNOM PENH, Cambodia, 4 April 2015 – My country, Cambodia, endured a long conflict in the recent past. Although the war has ended, we are still living with its consequences. One of them is represented by landmines and other explosive weapons, which still litter our land decades after the violence ended. In 2013, 111 people were victims of these weapons, 23 of them children. As my country rebuilds itself, we are working to clear these weapons, keep our people safe, and provide assistance to those who have been affected by these explosives. UNICEF supports these efforts by implementing school mine risk education programmes; training teachers and government workers on how to help prevent incidents; providing learning materials; and helping local organizations to assist victims with disabilities.